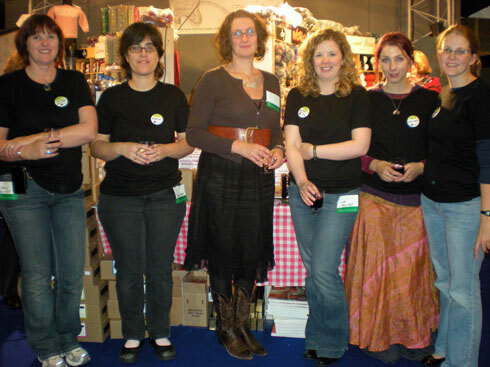 Yesterday, the Knitting and Stitching Show kicked off at the RDS here in Dublin. Today was my first day working at the shop stand. 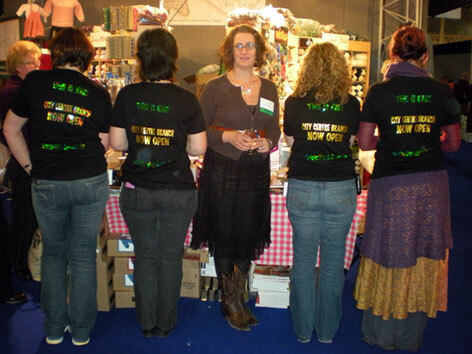 We were really lucky to have Louisa Harding (designer extraordinaire) accompany us on the stand all day. She gave a seminar in the morning where she talked about how she got going and where she gets her inspiration from. Unfortunately I didn’t get along to the seminar myself but I really enjoyed chatting to her throughout the day. She was good fun and very friendly… she even went along with some photos! Tomorrow we’ve got Debbie Bliss with us. She’s going to give a seminar, too, at 11am so if you are planning on coming to the show tomorrow, come early and swing by the seminar. It is free in and will definitely be interesting! I am really looking forward to meeting her… she may even permit me to touch the hem of her gown… The show goes on until Sunday so if you do come along, say hello! I am really impressed with the standard of the show this year. Last year, it was full of irrelevant exhibitors. This time around, however, there are many crafty stalls to oogle at and what I have seen so far of the exhibitors has been excellent. I haven’t made it upstairs to check out the guilds and other exhibitors yet but I will definitely try to do so tomorrow. I am very tired today because I spent Monday to Thursday in Barcelona on choir duty. Monday was very tiresome because we had a 7am flight. Normally I wouldn’t plan to leave until 5am but I didn’t want to alarm the group by being tardy so was quite early to the airport. Tuesday was equally tiresome because it poured rain from morning to night. I wasn’t going to be put off, though, and plodded around in circles until I found All You Knit Is Love. It is not at all difficult to find, unless you are me and in dire need of some sort of GPRS, knitted or otherwise. I got some beautiful Drops Alpaca (more mittens!) and had a great chat with the guy on duty. He had super English and we talked about all the cool patterns you can get Drops site. I’ll show you what I got next time but for now I leave you with the church that we sang in on Wednesday evening. 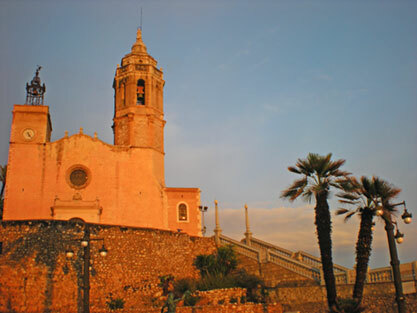 We travelled north to a small town called Sitges. It absolutely poured down during the afternoon but it cleared up towards evening time and we were able to prom on the promenade. You see those steps to the right of the photo? The sea crashes over them about every fifteen seconds so ascent had to be well timed! Aileen, won’t you take me away? 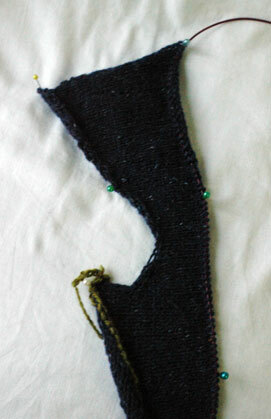 I finished Swallowtail going down on the train on Wednesday and got it all blocked out yesterday. I was nearly late for work, but it was worth the rush! There have been many blue yarns calling my name recently. Bloom from Rowan 36 is a sleeveless sweater knit from side to side. I’ve decided to save myself some sewing and started with a provisional cast on. From what I can tell so far, it is all going according to plan. The yarn is my old faithful, Felted Tweed. …And Icelandic Sweater from Crochet Me. I have had this yarn (Jaeger Matchmaker Merino 4ply) for about two years now. I originally bought it for this but changed my mind when I realised that I never wear cardigans shaped like that. Someone brought it to my attention recently that I have yet to crochet myself an actual garment so I figured I had better rectify that as soon as possible! I finished Mitten #2 but they both need thumbs. I will wait until they are properly finished because the thumb gussets are really cool and you can’t get the full effect if there are no thumbs. I found my retractable measuring tape in Alb’s car last night. This, unfortunately, is not a cause for rejoice. It is one of those ones that retract suddenly in a violent wriggling manner so if you depress the button whilst peering closely at a swatch, wondering if that is half a stitch or if you are actually at gauge, your reflexes are keenly tested. Obviously, I don’t like it. I had a lovely one – it was bright red with a wide tape and it retracted in a very orderly fashion – but I left it on the train under a newspaper. Since then I have been cursed with this disgusting, violent, orange plastic one that I cannot lose no matter how hard I try. Things are really moving along, aren’t they? It’ll be Hallowe’en soon. I used to associate the passage time with the impending horror of exams but, even though I’ve been finished college two years now, this is the first year I feel properly free from that awful constricting feeling you get in your chest. It makes the changing of the leaves and those chilly evenings coming in so much more quickly now all that more enjoyable. 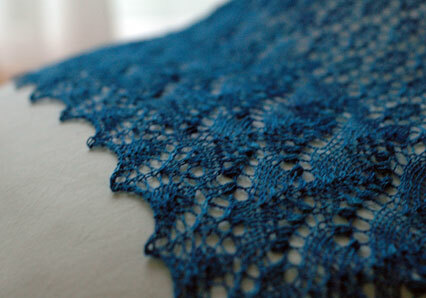 What better way to celebrate than with some nearly-finished lace? 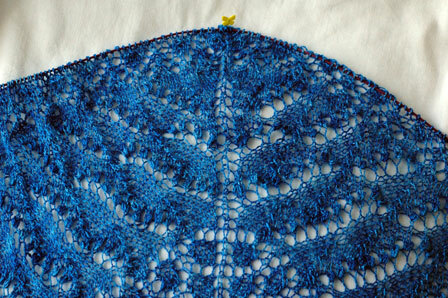 Unblocked lace really doesn’t do the pattern any justice whatsoever but I think it will be very pretty. I was knitting on it last Saturday in the shop in town when Mairéad came in to see me. The pattern is made up for four charts. You work through all four and you’re finished. I was halfway through the second one and it was looking very small. Mairéad advised that I repeat one of the middle charts, otherwise my shawl would be very small indeed (“teensy” was the exact description). 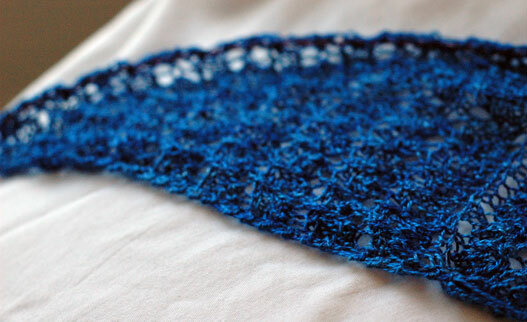 I figured this was advice worth heeding and the extra repeat didn’t stretch my patience too much – although I am more than ready to be finished with the purl rows now (the only drawback to lace, really). This has gotten a lot of attention because I am travelling up and down to Ballina a lot to rehearse with the choir. We are travelling to Barcelona for a concert next week. 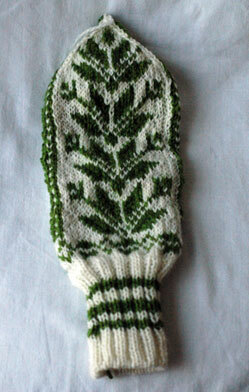 I could take any more purling yesterday on the train back up, so I dug out my mitten and finished up the first one. Again, a good blocking will get all those strands to tow the line. I’m travelling down again this afternoon and back tomorrow morning so hopefully by Friday, I will have some more to show! I spent today getting over a combination of a small infection and a coeliac reaction. Yay! There wasn’t even any knitting but luckily, there was yesterday and I have some things to show. The yarn is a beautiful 100% silk from Claudia Hand Painted Yarns that I picked up at KnitKnack in New Jersey during the summer. 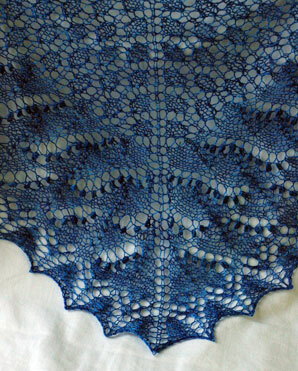 The pattern is the Swallowtail shawl from Interweave Knits, Fall 2006. I think the pattern is now available to download by itself now – have a look for it if you’re interested! It is a great little pattern. I was inspired by Laurent‘s a few months ago and was waiting to find the perfect yarn for it. 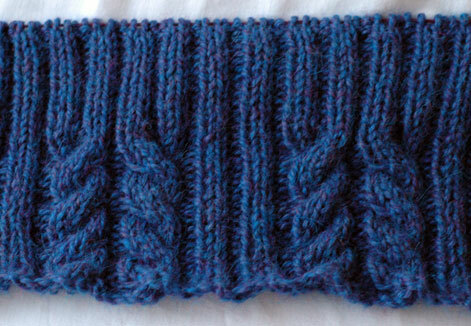 The pattern is interesting without being too complex so even the purl rows are bearable. 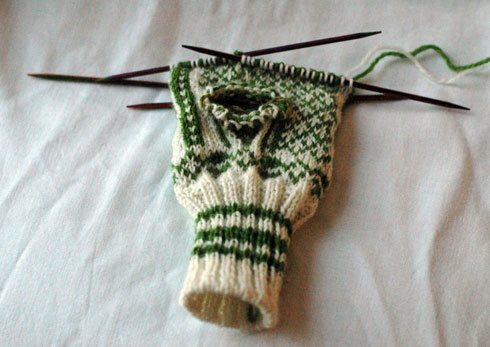 I have been really enjoying watching the colour pattern emerge on my mitten, too. The white and green go together even better than I expected. The cuff looks very small but it stretches out a lot! I separated off the thumb last night. 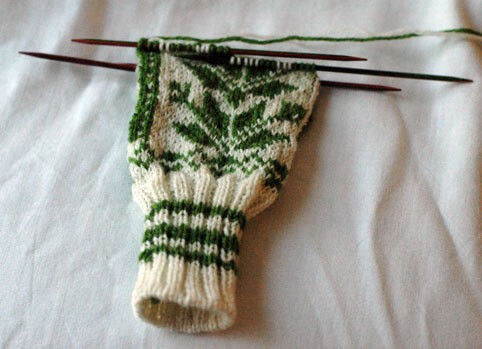 I love how the gusset pattern grows out of nothing – it will continue up the thumb, too. Juliaca has been growing slowly. 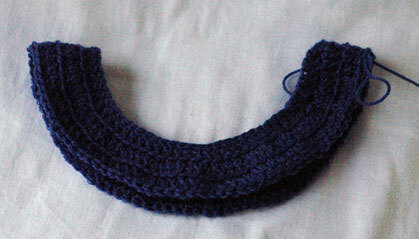 It only feels slow because I am knitting both front and the back together at the same time. I love the colour and texture of the fabric – it’s going to be really really snuggly. In other news, three more pattern ideas I had have been accepted by Yarn Forward magazine. I am really excited about all of them and can’t wait to see how they knit up! 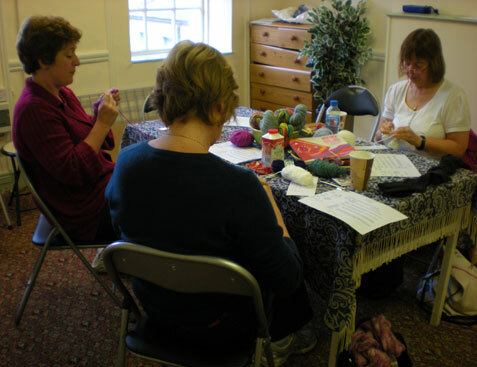 I taught a beginner’s crochet class today at This is Knit. We have been inundated for requests for crochet classes so this was actually an extra one that we scheduled into an unexpected space. My beginners got on great! We worked through a sampler of all the basic stitches, from single to triple, then on to a simple flower that used some of those stitches, and we even had time to start a square! 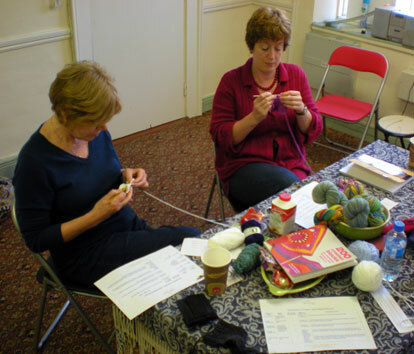 I love teaching crochet because it’s all about opening up a whole world of possibilities! More beginners next weekend and then we have Next Steps crochet in November. Happy days!